This pattern is available as part of the Jane Cowl Series ebook containing 3 cowls – Little Loop, Double Loop, and Grand Loop. Each piece varies in size, wool, and gauge, while sharing the wonderful and toasty Flame Chevron lace. Trimmed in garter stitch and worked in the round, this lace is a 7 stitch x 24 row repeat. 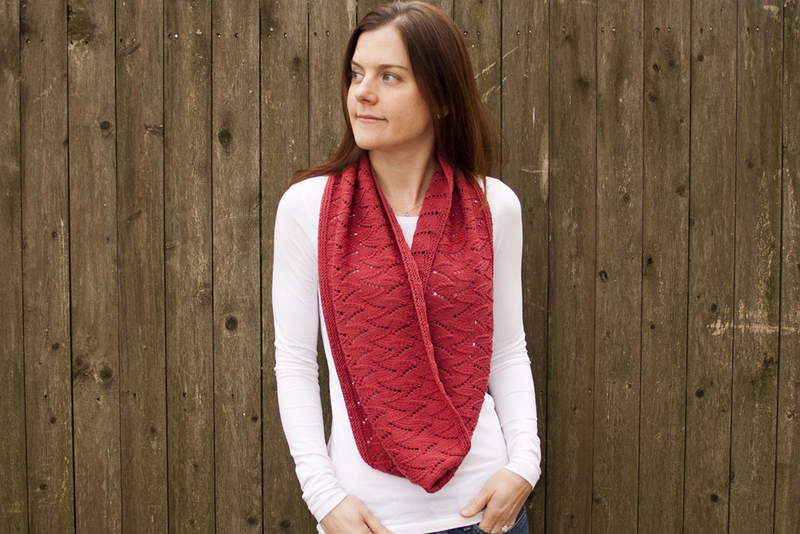 The Jane Cowl Double Loop is long enough to circle the neck twice. 3 skeins, or for comparable yarn, approximately 510 yds. Long-tail cast on, circular knitting, decreasing (k2tog, ssk), and increasing (yo). 8 page pdf contains instructions for 3 cowls, and includes photographs, lace descriptions and charts, and relevant abbreviations. You'll find this ebook collection for sale on Ravelry.